One month of Tweets, guest blog posts, costumes, videos, giveaways, constant Internet refreshing, trying to answer emails in rural Quebec, and two million ways trying to keep things fresh and fun later, the Uncanny Magazine Year Two Kickstarter is OVER. The fact that you’re reading this tells you that we were successful. Not only did Year Two fund, we reached every initial stretch goal. Year Two will have all of the content that Year One had, plus a spiffy new webcomic by the amazing Liz Argall. Thank you to all of our backers, people who donated nifty things, folks who boosted the signal, interviewed us, or hosted guest blogs, people who made and starred in our video, and our amazing staff of Managing Editor Michi Trota, Podcast Producers Erika Ensign and Steven Schapansky, Interviewer Deborah Stanish, and Reader Amal El–Mohtar. We are so grateful and honored to be doing this again. We love Uncanny Magazine, and we believe we’re publishing important, quality Science Fiction and Fantasy stories, poems, podcasts, and essays, featuring diverse voices and pieces with a certain Uncanny point of view. Based on the fact that so many people support us with Kickstarter, through subscriptions, and on Patreon, clearly a large portion of the community of SF/F readers, creators, and fans agree. While this industry has its disagreements and kerfuffles, what keeps us here at the end of the day is a loving and supportive community. Not a week goes by when the SF/F community doesn’t rally around causes from sick authors without enough health insurance to bookstores that can’t remain open without help. In our own case, in 2013 Jim C. Hines and others raised a tremendous amount of money by recreating sexist cover poses and donated the proceeds from the fundraiser, and the calendar that followed, to the Aicardi Syndrome Foundation. The head of the foundation was near tears when he thanked us and explained that Jim and our SF/F community made it possible for them to hire people to create a proper website that now offers great information and support to all of the families of children with our daughter’s syndrome. It wasn’t possible without all of you. Uncanny Magazine isn’t a charity, of course. We created it because we want to bring more art, beauty, fun, and kindness into the world, and perhaps make a little money to help with Caitlin’s increasing healthcare costs. We want to share gorgeous, amazing things with this wonderful community, and we want everybody to feel like they’re a part of that. This is how we give back for all of your warmth and love. Thank you for making Uncanny Magazine possible, and joining the Space Unicorn Ranger Corps on this special, ongoing mission. So begins Year Two, the second of many! If you missed our second Kickstarter and still want to help support Uncanny Magazine, we have great news for you. There are many ways to support what we’re doing, including a spiffy Patreon and subscriptions from our friends at Weightless Books. As of this issue, we also have a new, exciting option. We now offer Amazon Kindle subscriptions! For only $23.88 per year, you will automatically receive all of the content on the day of the release on your Kindle rather than waiting a month for the second half of the issue. It couldn’t be easier! If you can’t financially support Uncanny Magazine, there is still another way to join the Space Unicorn Ranger Corps. Please spread the word about the magazine and its contents. That’s it! By sharing the awesome on social media, blogs, and review sites, you make it possible for more people to experience the thoughtful essays, passionate poetry, vibrant covers, and stupendous stories. Where in the World Are the Thomases? Sadly, we won’t be at the World Fantasy Convention this year. We will, however, be at a pair of Chicago area conventions this November—Windycon and Chicago TARDIS. We love both, especially Chicago TARDIS which is one of our home conventions. We will also be attending ConFusion in the Detroit area this year in January. This is the first time the entire family has attended, and we’re positively thrilled. If you see us at any of these conventions, please come up and say hi (we’re the ones pushing the adorable girl in her wheelchair). 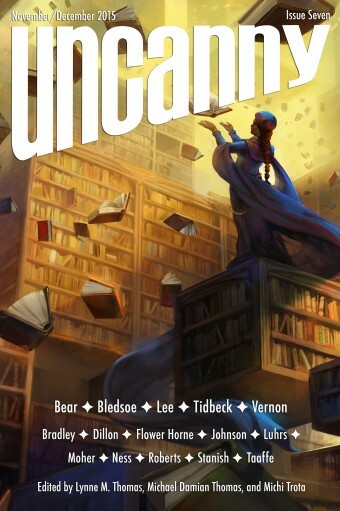 Year Two of Uncanny Magazine kicks off with a fantastic cover by Julie Dillon, “The Archivist.” (Which is especially neat for us since Lynne’s day job is being a Curator/Archivist in a library.) Our new fiction features Ursula Vernon’s delightfully askew update of a familiar tale “Wooden Feathers,”Elizabeth Bear’s wonderful novelette of aging heroism “And the Balance in Blood,” Karin Tidbeck’s important message to all writers “A Call to Arms for Deceased Authors’ Rights,” Yoon Ha Lee’s majestic tale of gaming and space travel “Interlingua,” and Alex Bledsoe’s Southern Gothic yarn “I Seen the Devil.” Our reprint this month is Alaya Dawn Johnson’s twisted zombie love story “Love Will Tear Us Apart,” originally published in the Zombies vs. Unicorns anthology. Finally, Deborah Stanish interviews Yoon Ha Lee and Alex Bledsoe about their stories. Podcast 7A features Ursula Vernon’s “Wooden Feathers” as read by Max Gladstone and Amal El–Mohtar, Mari Ness’s “The Thirteenth Child” as read by Erika Ensign, and Deborah Stanish interviewing Ursula Vernon. Podcast 7B features Karin Tidbeck’s “A Call to Arms for Deceased Authors’ Rights” as read by Erika Ensign, Lisa Bradley’s “Aboard the Transport Tesoro” as read by Amal El–Mohtar, and Deborah Stanish interviewing Karin Tidbeck. This issue also has some comings and goings in the Submissions Editors’ ranks. Alex Kane is leaving us to focus on other projects. We wish him well in his future endeavors and are grateful for all of his hard work. Meanwhile, Lena Ye has joined us as a poetry Submissions Editor. Welcome, Lena!